WHY all the fuss about 1989? Twenty years on, the idea of millions of people yearning for the humdrum joys of daily life in welfare capitalism no longer seems so startling or moving. Familiarity has dimmed the excitement of the freedoms won: to travel, to shop, to exchange currency, to change jobs, to move house, to think, to speak. Experience has scarred the belief that “Western” life is a self-correcting nirvana, where officials are efficient, politicians public-spirited and justice incorruptible. For about a third of the world’s population, the fall of the wall is probably history, not real life. The best way to appreciate the significance of 1989 is to remember what it was a revolution against. The new edition of Alexander Solzhenitsyn’s epic novel, “In the First Circle” (Harper Perennial, $18), captures better than any other work of fiction the quintessence of communist rule at its Stalinist peak: all-pervasive, paranoid, oppressive, incompetent, lethal. By 1989 that system had become more rotten and less frightening, especially in the east European satellites of the evil empire. But the climate of fear and lies was still there, with political prisoners, murders, beatings and blackmail, especially in the grimmer places such as East Germany, Czechoslovakia and Romania. Eight hectic months in 1989 turned the winter so starkly described by Solzhenitsyn into spring. The new edition of the novel differs subtly but importantly from the version published in English in 1968. That was based on a self-censored text that the author had prepared in the hope of getting it published in the Soviet Union. It left out the hero’s espionage for America, the Christian faith of his friend and other details that the Soviet authorities would have found utterly intolerable. The longer text is deeper and darker. For all its malevolence, the Soviet empire was like a Ponzi scheme, dependent on ever-increasing amounts of money. When that ran out, its regimes imploded. That is the story told in Stephen Kotkin’s slender but snappy book, which concentrates on demoralisation and divisions in what he calls “uncivil society”, the circles of power. This side of life, he argues, was more important than the dissidents, who were lionised in the West as “civil society”, but ignored and unknown at home. Mr Kotkin is right that bankruptcy forced some regimes to make concessions, but he greatly overstates his case. Czechoslovakia was under little immediate economic pressure to change. As the grim examples of Romania then and North Korea now both show, a sufficiently determined communist leadership can survive economic failure through repression. Moreover, 1989 is the story of people as well as processes. Although the reformers and ship-jumpers inside the regimes were important, in most countries it was the dissidents who forced the pace of change. The real point, though, is that fitting a dozen complex stories into a single analytical straitjacket is a nonsense. Communism collapsed differently in every country, as the journalists who reported the story could see. Their accounts published for this anniversary are necessarily episodic: too much was happening for one person to witness it all. But each book carries the vital touch of personal experience. The best read is the irreverent and engaging account by Peter Millar, who writes for the Sunday Times among other papers. Fastidious readers who expect reporters to be a mere lens on events will be shocked at the amount of personal detail, including the sexual antics and drinking habits of his colleagues in what now seems a Juvenalian age of dissolute British journalism. He mentions his long-suffering wife and children rather too often, but the result is full of insights and on occasion delightfully funny. The author has a knack for befriending interesting people and tracking down important ones. He weaves their words with his clear-eyed reporting of events into a compelling narrative about the end of the cruel but bungling East German regime. At the other end of the spectrum is the Olympian perspective of a former Newsweek bureau chief for Germany and eastern Europe. Michael Meyer ranges widely and not always deeply. His best reporting is on Hungary, particularly on the decision by the reform-minded leadership there to open the border with Austria. That destabilised the East German regime, first creating an embarrassing outflow of refugees, and then forcing the Berlin authorities to restrict travel freedoms still further. This is a competent and professional account—though it does not quite merit its claim to be the untold story. A more solid and less pretentious book comes from Victor Sebestyen, who has covered the region since the 1970s. His book deals more thoroughly with both history and geography. He starts the story, rightly, with the election in 1978 of John Paul II, the Polish pope. He highlights Ronald Reagan and Mikhail Gorbachev, the other two giant figures who ended the communist epoch. Unlike his rivals, the author devotes at least some space to developments in other continents. Few journalists covering the region lived there in the communist era, inevitably giving their accounts a second-hand feel. An exception is Nick Thorpe, who moved to Budapest in 1986 and has mastered Hungary’s beautiful, impenetrable language. His account of the interplay between dissidents and reformists inside the regime shows a level of sympathy and nuance that is missing from more ambitious accounts—and makes his own chapters on events in other countries look skimpy. Almost more interesting than his description of the collapse of Hungarian communism are Mr Thorpe’s insights into what came next, told through the unlikely prism of obstetrics. Abominable practices stayed in place after 1989, treating birth as a medical emergency in which painful and humiliating procedures such as episiotomy, shaving and enemas were mandatory. Parents’ wishes were habitually ignored. Mr Thorpe and his wife decided they wanted their children born at home: a normal procedure in western Europe but illegal in Hungary. The medical bureaucracy’s cartel-like resistance gives a pungent flavour of the lingering communist-era mindset that the region still has to shake off. No whiff of the personal contaminates Mary Elise Sarotte’s scrupulous account of the high politics and diplomacy of 1989. With remarkable diligence, she has interviewed almost all the surviving participants, and quarried government archives and other libraries for documents that illustrate the decision-making (and lack of it) that year. The result is a tale of hypocrisy and indecision in high places. Some of it, however, is commendable. After the Tiananmen massacre in June, communist leaders could not quite summon the willpower to use mass murder to stay in power. On the Western side, it is sometimes deplorable. For all her fiery freedom-loving speeches, Margaret Thatcher, then Britain’s prime minister, privately loathed the idea of German unification and tried to sabotage it, covering her tracks as she did so. The then American president, George Bush senior, comes across badly too, giving tepid and unemotional responses in public and missing the chances that 1989 presented. Ms Sarotte debunks myths: the opening of the wall on November 9th was not planned, let alone forced. It was the result of a bungle: a bureaucratic rule-change misleadingly announced and over-excitedly reported. German unification was not inevitable: outsiders, the new East German leadership and many West Germans wanted something else. It came thanks to a combination of electoral pressure in the East and highly effective arm-twisting by the West German chancellor, Helmut Kohl. Missing in all this is a powerful voice from the countries concerned. Writers such as Solzhenitsyn, Czeslaw Milosz, a Polish poet, and Czech novelists such as Milan Kundera, Ivan Klima and Josef Skvorecky helped the world understand life under communism. But no writer from the region, in fact or fiction, has produced a matching account of the collapse of the Iron Curtain and its aftermath. The way in which the countries of central Europe, the Baltics and the Balkans emerged from communist captivity, made peace (mostly) with their history, and rebuilt the economic, legal, moral and psychological order destroyed five decades previously is a gripping story. It has yet to be fully told.The author comes across as more at home with her sources than with the region’s wider history. The pope, she writes, “continued to dominate the Vatican” in 1989. That is what popes normally do. In analysing the question of whether NATO’s eastward expansion broke a promise to Mr Gorbachev (it didn’t), she overlooks the worries of countries in central Europe about Russia’s ominous drift back to old habits in the 1990s. PICTURE yourself in a smoky café somewhere in the middle of Europe—Prague, say—in late 1989. Sipping muddy coffee sweetened with gritty sugar, served by a sullen waiter at a greasy table, you are discussing the future with friends. Their ill-cut clothes are in dull blue, brown and green, the hallmarks of planned-economy tailoring. Your foreign gear stands out a mile. In the café window, posters tell of a revolution won (see article). One is a poignant death notice for “Comrade Fear”—the once omnipresent and omnipotent embodiment of the totalitarian regimes, newly toppled by candles, flags and courage. Another poster shows a simple starburst, with the words “Gloria in Excelsis Deo”. Religion, like so much else, is now a matter of free choice. But a third poster shows the task ahead. It depicts Europe divided by a cliff that runs along the old Iron Curtain. A precarious ladder leads from the gloomy east to the sunny western uplands. “Back to Europe”, it reads. Before the communist era, countries such as Czechoslovakia, Poland and Hungary were at the centre of the continent, not its impoverished and isolated backwater. The cliff looks dauntingly steep. Climbing it means long queues at Western consulates before facing the suspicious officials inside them. Western Europe may have cheered the revolution, but it fears a flood of riff-raff from the east. Abroad, easterners feel like humiliatingly poor relations. Their savings and salaries are all but worthless. You buy the coffees without a glance at the bill. When easterners head west, they pack sandwiches. Ghosts of the past are everywhere. Some are welcome. Old songs, long-banned, are on the radio again. Heroes once vilified by official propaganda are celebrated. Other ghosts are more sinister. Central Europe before communism was no paradise. What will emerge as the region defrosts? Will Hungarians be content with their constricted borders? Will the Germans, so brutally deported from Silesia and the Sudetenland after the war, now demand justice? Will it be safer to be a Jew—or more dangerous? Nor are the more recent spectres of the evil empire laid to rest. Will the secret police, still hunkered in their bunkers, give up their power peacefully? What will happen to the millions of guilty secrets in their files? Scariest of all, what happens if the wind from the east changes? Hundreds of thousands of Soviet troops still occupy the region. Will they leave peacefully? Facing all those questions is a fragile new political elite: dissidents, oddballs, turncoat communists and university professors, blinking at the task of building justice and prosperity on the ruins of communism. Central Europe 20 years later, if glimpsed from 1989, would have seemed a glorious pipe-dream. A generation has grown up in free and law-governed societies. Fears of economic ruin and political chaos have proved unfounded. Ten countries have climbed that cliff and joined the European Union. Two more, Croatia and Albania, have joined NATO. For all the unsolved and new problems facing the region now, it is voters, not outsiders, who determine who rules and how. Judges, lawyers and police have shed the shackles of Communist Party control. Courts may be slow, politicians meddlesome and bribery a problem. But nobody can count on impunity. The huge exception has been Yugoslavia, seen in 1989 as a template of multi- ethnicity and pluralism, a halfway house between centrally planned socialism and the harsh and distant world of Western capitalism. It is still an example, but a dreadful one. For a decade, the outside world was unable to stop rampaging ethno-nationalist militias turning ancient grudges into bloody revenge. Some 140,000 people died in wars in Bosnia, Croatia and Kosovo, as authoritarian politicians purged their countries of those they saw as subversive or subhuman. That was far worse than anything witnessed in central Europe before the war, though it still pales by comparison with the horrors of the Nazi era. Even outside ex-Yugoslavia, authoritarian and bigoted ideas still haunt the political fringe. Explicitly racist parties come and go in some parliaments; in Slovakia, one is in the government. But in no country over the past 20 years have they gained full political power. That is cause for relief and pride. The economic achievements are barely less astonishing. At the end of 1989 it was easy to imagine the region staying mired in poverty for decades. Only the over-60s remembered how a market economy worked. For decades official propaganda had lambasted capitalism as akin to cannibalism. Industry was state-owned and run by party placemen. Management meant hunting for resources and then hoarding them, not dealing with costs, customers and competition. Foreign trade involved haggling with state planners in Russian, not closing deals in English. So even granted the will-power to stabilise the economy, privatise state property and liberalise markets, would it work? As Lech Walesa, Poland’s first freely elected post-war president, noted, it is easy to turn an aquarium into fish soup. Reversing the process is much harder. Yet free prices, free exchange rates, free trade, free labour markets and privatisation have proved a colossal success. The profit motive—however ugly, sleazy or vulgar—unleashed the caged talents of millions of entrepreneurs. Foreign investors, at first deterred by scarce telephones, bumpy roads and obnoxious officials, have come in droves, bringing a huge transfer of management and technical know-how. The first wave came because of low labour costs. Membership of the EU attracted the next influx. The EU has improved life in other ways too, forcing the pace of reform as a condition of membership and providing billions of euros for modernisation. Borders once sealed by minefields are now just lines on the map. You can drive from the Baltic Sea to the Mediterranean without even showing your passport. Water and air are cleaner than in 1989, transport faster and safer. For the young, flexible and ambitious, the past 20 years have proved a bonanza. For the losers—the old, the timid, the dim—life has been punishingly difficult (see article). Yet outside the former East Germany, nostalgia for the past plays no part in politics. Only in the Czech Republic does a Communist party still have a political role. Elsewhere, the former proletarian internationalists have rebranded themselves as slightly sleazy centre-leftists. The third big achievement, alongside democracy and prosperity, is the partial restoration of public-spiritedness, trust, decency and kindness. Communism habitually imposed horrible moral choices: denounce your colleague, or your child will never go to university. It preached altruism but ingrained selfishness. Statistics can barely capture the legacy of 50 years of lies and fear. Freeing central Europe’s captive nations has proved far easier than freeing its captive minds. Most adults in the region spent their formative years under communism. Only when those in charge have no memory of totalitarian rule will communism’s shadow finally be lifted. The biggest disappointment is the continuing power and wealth of the old system’s elite, who have proved much better at running the capitalism they decried than the socialism they preached. Party bosses and their secret-police henchmen successfully squirrelled money abroad, using it to buy assets cheaply in the chaotic years of the 1990s. The western half of the continent can still seem far off when viewed from the middle. And vice versa. Toomas Hendrik Ilves, Estonia’s sharp-tongued, American-educated president, says Westerners privately regard people from ex-communist countries as “troublesome cripples whose views can be ignored”. Seen through the fug of a café in late 1989, 2009 looks pretty good. But central Europeans can be forgiven if they see the present a bit cynically. Seen from the Kremlin, history is simple: the Soviet Union, with extraordinary sacrifice, liberated Europe from fascism and Europe should be grateful. Anyone who disagrees is a fascist. Stalin may have been bad in some ways, but he was an effective leader in difficult times. The Soviet Union had its flaws, but so do other countries. 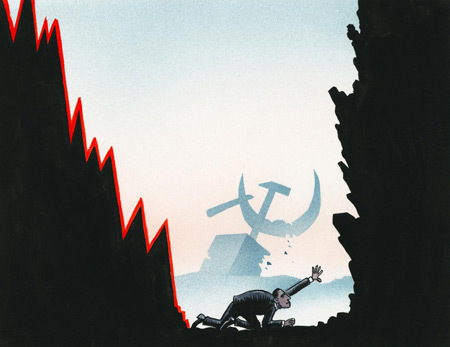 Criticism reflects double standards and jealousy of Russia's recovery. This simplistic and triumphalist version of 20th-century history is the central plank in Russia's new ideology. 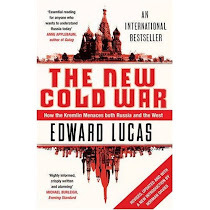 Edward Lucas, a journalist and author who has been covering the region for more than 20 years, will show why it is not just mistaken but pernicious. The revival of Stalinist history is a threat to the countries of Eastern Europe--and a dreadful dead end for Russia. Edward Lucas is the Central and Eastern Europe correspondent for The Economist. He has been covering the region for more than 20 years, witnessing the final years of the last Cold War, the fall of the Iron Curtain and the collapse of the Soviet empire, Boris Yeltsin's downfall and Vladimir Putin's rise to power. From 1992 to 1994, he was the managing editor of The Baltic Independent, a weekly English-language newspaper published in Tallinn. He holds a BSc from the London School of Economics, and studied Polish at the Jagiellonian University, Cracow. The New Cold War is his first book. Advance booking is recommended, tickets at the door subject to availability. To book please call the Louise Blouin Foundation on 020 7985 9600, payment is required upon booking.